Integration is a buzzword in mental health care, but what does it really mean? Such a plethora of definitions leads to a lack of clarity about what activities need to take place, where, and by whom to really make a difference in improved health for people with mental illness. Amidst the noise, the good news is that the weight of evidence points to an answer, the collaborative care model, pioneered by Dr. Jϋrgen Unϋtzer and his team at the University of Washington. More than 80 randomized controlled trials demonstrate the effectiveness of the collaborative care model for improving mental health outcomes across a range of settings. All five pillars are required for the collaborative care model to be effective. Not three, not four. All five. When organizations successfully operationalize this model, numerous studies have pointed to improved outcomes and cost-savings, both for medical and behavioral health. All five pillars are required for the collaborative care model to be effective. Not three, not four. All five. When organizations successfully operationalize this model, numerous studies have pointed to improved outcomes and cost-savings, both for medical and behavioral health. For example, one study comparing financial outcomes of clinics practicing collaborative care versus those that don’t, showed that while health care costs increased for all, the clinics practicing collaborative care experienced only 73 percent of the increase experienced by business-as-usual clinics, with a 54 percent decrease in ER utilization and a 49 percent decrease in inpatient psychiatric care. Despite this compelling evidence, the collaborative care model has not yet reached widespread adoption in primary care settings. However, this reticence could change if CMS adopts a billing code for reimbursing the core activities of the collaborative care model. The collaborative care model is also supported by the American Psychiatric Association (APA). Primary care is the “de facto” mental health system for the majority of mental illness. However, for folks with serious mental illness (SMI) who do not optimally engage with primary care, their primary relationship is more likely to lie with community mental health centers and other specialty settings. In this scenario, effective integration requires the colocation of primary care expertise and/or nurse practitioners to address the physical health comorbidities of people with SMI. The evidence base for this approach may be thin, but it is the right thing to do for this population. Due to our multiple touch points across the continuum of care, Beacon Health Options is in a unique position to drive integration in specialty care as well as primary care settings. 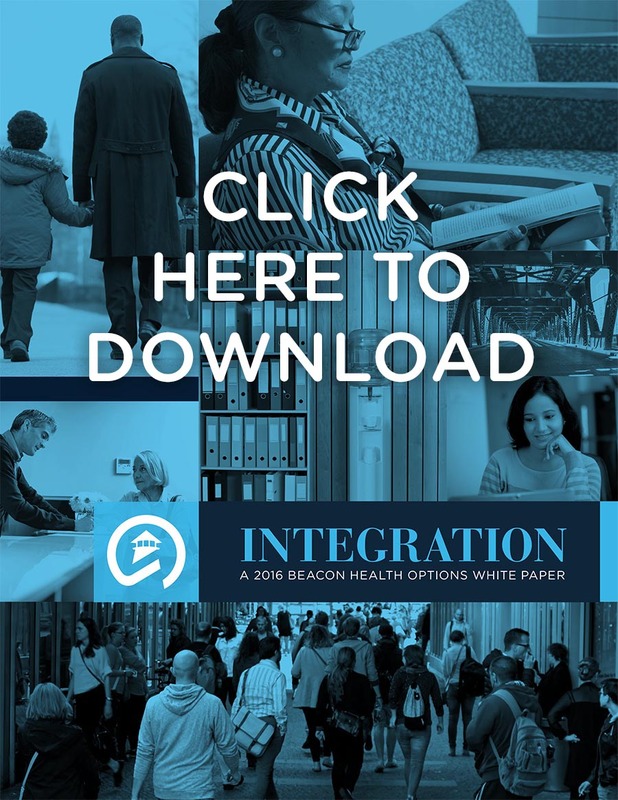 To learn more about the collaborative care model, and Beacon’s call to action for integration, we invite you to read our white paper on the topic, titled “Integration,” by clicking on the image. Thank you for such a comprehensive look at what integration really means. I found your shout out to individuals with lived experience (peer specialist) to be profound indeed. Your topic heading of “social model of recovery” really hit the nail on the head. And in your “how do we know if care is working” well, you need only look at the number of individuals who for example are: effectively dealing with personal stigma; staying engage in treatment; developing meaningful support groups in addition to greater self efficacy to see it. Excellent presentation at webinar today!! Great and useful information!! Extremely knowledgeable and skilled presenters. Thank you for the opportunity to be a part of the Beacon Health Options Integration webinar! !